NordicTrack Treadmill Sales in Canada | Get the Lowest Price! NordicTrack x11i Incline Trainer – Read our full review here. The award-winning NordicTrack Treadmills are available to Canada customers and come with Free Shipping when you order online directly from the NordicTrack Canadian site. However, selecting the right treadmill for your budget and your body can be a challenge with all the various models at different price ranges. In addition, they also offer their popular Incline Trainers as an alternative to your typical treadmill. In order to assist you in the buying process, we have broken down the various categories and offer our expert advice. NordicTrack released their Incline Trainers several years ago. Ever since, they have been their top sellers. In fact, when we were last at the NordicTrack headquarters, their product manager said the Incline Trainers were the cardio machine of choice with the employees. The concept of the Incline Trainer is to train at a steep incline rather than at a high speed. The advantage is you still get the same cardio intensity of running without the stress and impact to your joints. The Incline Trainers can incline up to 40%, and if you have ever hiked a steep hill or mountain, you know what a workout that can be. This gives a very efficient workout in less time. In addition, the Incline Trainers decline to 6% so you can simulate going up and down mountains. Unlike the BowFlex Treadclimbers, you can also lower the 60” deck and use it as a running treadmill. Finally, these are heavy machines that are as heavy as commercial treadmills if not heavier. They are rock solid. 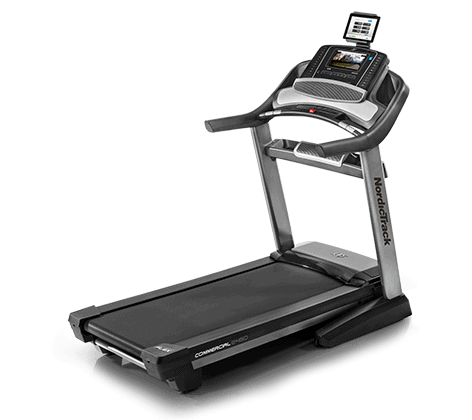 NordicTrack Commercial 1650 with a 10″ Web Enabled Touchscreen – Read our full review here. The NordicTrack C Series treadmill are their budget to moderate price residential models. They range from $799 – $1,299. What makes these models so appealing is not only the price, but also the value you are getting. When you compare the specs to other comparably priced models of other brands you find that you are typically getting bigger motors, longer decks and generally more features. 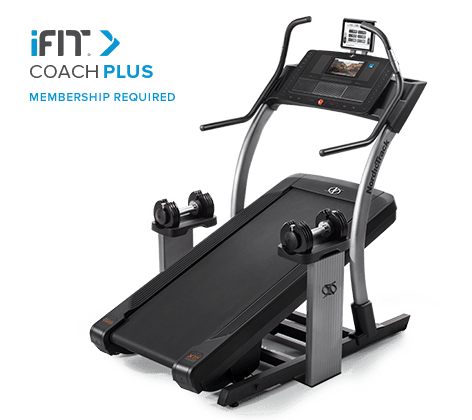 In addition, each of these treadmills come with the optional iFit Coach (See Below), which is the most innovative motivational technology found on any cardio machine. For example, the NordicTrack C990 comes with 3.0 CHP Motor, 7” Web Enabled Color Touchscreen, 20″ x 60″ Walking Belt, Flex Select Cushioning and more. With the C Series it all about getting the most for the least. Although the NordicTrack Commercial Series treadmills are typically very heavy-duty machines, I feel the name “Commercial” can be a bit misleading. These machines may withstand a lite commercial setting, like a fitness room at a hotel or club, but they are not quite the industrial strength quality of a Precor or Life Fitness treadmill. However, with those machines you pay thousands more. That said the NordicTrack Commercial Series are treadmills designed to take a beating. In addition, they have industrial strength motors, long and wide decks and an array of features that NordicTrack is known for. Each treadmill comes with a full color Smart HD Touchscreen display. If you are looking for a treadmill that can take a beating while providing state-of-the-art technology, then the Commercial Series machines should be a serious consideration. NordicTrack Commercial 2950 with a 22″ HD Smart Touchscreen – Read our full review here. 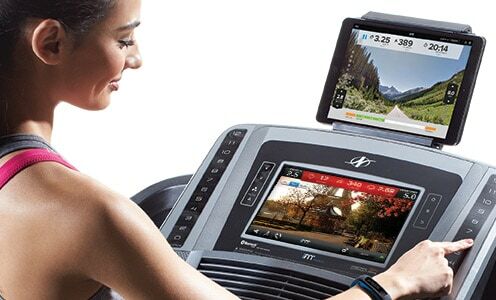 Full color touchscreen displays available on most of their treadmills. On the C-series treadmills, when you subscribe to iFit Coach, you can actually access the Internet on the treadmill as you workout. Create Customized Workouts – With iFit Coach you have the ability to create daily customized workouts based on your fitness goals. These workouts can be progressive and increase with intensity as you improve. The workouts include verbal coaching. Get daily livecast fitness classes – Follow your favorite professional trainers as they lead you through intense cross-training exercises. Included is a iFit wearable for on-the-go tracking that can be used on and off the incline trainer. This allows you to track all your physical activity throughout the day. You have access to an extensive library of virtual workouts that you can view on the full color display. For example, you can walk the beaches of Hawaii, or hike the mountains of Switzerland, and in the process you get audio coaching. What makes iFit virtual training so impressive is that your incline trainer will mimic the terrain of the video. Track your workouts and your progress with helpful charts and stats. Studies show that individuals that track their workouts are more likely to achieve their fitness goals. 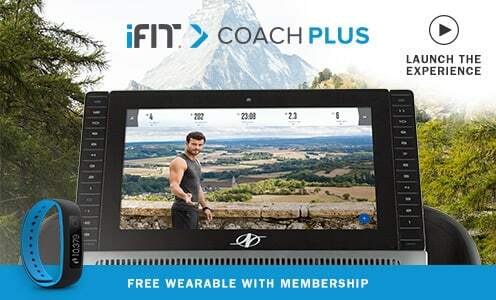 Note: iFit Coach Plus on the Commercial Series and Incline Trainers requires a 1-year paid subscription with checkout. The C-Series has iFit Coach Plus as a paid option. Learn more here. NordicTrack Treadmill Canada Sales – How to Buy! NordicTrack Commercial 2450 – See our full review here. It really is quite simple. After you have checked out our reviews, you will find convenient links to the Canada version of the NordicTrack. From there, you can go to the product page and shop online. Note that NordicTrack offers Free Shipping on all their models, but that can be often to the curb. Sometimes they may drop it off in the driveway. You may want to consider upgrading to indoor delivery because the machines are very heavy. Regardless of which elliptical trainer model or design you buy, know that NordicTrack is the leading fitness equipment manufacturer in the world, in addition to being the most innovative. If you are considering an elliptical trainer, NordicTrack should be a consideration. And with their strong presence in Canada, you’ll have access to their Canadian sales and service network. Learn more and shop models available in Canada at www.NordicTrack.ca.